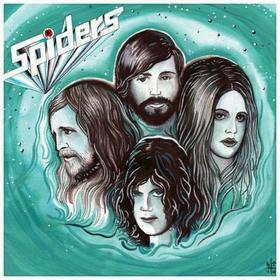 Spiders are a new band from Göteborg, Sweden. It features the drummer from Graveyard, the guitar player from Witchcraft, bass player from Midwest and a rough and ready female vocalist. The 10” is really short, 4 tracks in like 12 minutes but really cool music. Side A starts with the track High Society, which has a bit of bluesy guitar, a garage sound production and is pretty catchy and features a phased out guitar solo. Gracious Man is a bit more guitar driven with some nice wah and soloing throughout. Catchy stuff and a great track. Long Gone is a very short track, under 3 mins and probably the one for radio. Nothing Like You is a bit more powerful and features some nice drumming and cool guitar riffing and some intensely emotional singing at times. Some of these tracks you can hear hints of Graveyard and Witchcraft. This is a damn cool song. I was very impressed with this little 10” and it really leaves you wanting more. Cool band.